One of the simplest ways for the human body to replenish its energy and revitalize its health is through sleeping. For patients who suffer from sleep apnea, these benefits aren’t fully experienced. That’s because the condition involves frequent pauses in breathing that triggers the brain to send distress signals that awaken the person repeatedly throughout the night. As a result, what may seem like a full night of sleep can leave one feeling lethargic the next day. As previously mentioned, sleep apnea doesn’t just affect adults. Studies show that 5% of American children suffer from the condition, and of the kids who snore, at least 10% have some form of apnea. It’s important to seek the necessary treatment for the condition because it can lead to life-threatening health issues like hypertension, childhood obesity and poor heart function. Additionally, of the children diagnosed with attention deficit hyperactive disorder (ADHD), 25% have been found to have some form of sleep apnea. If you notice any of the above warning signs, then you should reach out to your child’s pediatrician to have a sleep test scheduled. 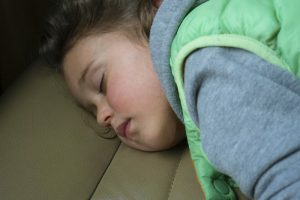 Then, if the results are positive for sleep apnea, your family dentist in Fort Worth can provide the therapy needed to help your child get the sleep he or she requires to remain healthy and functional. The usual method for treating the condition is with a continuous positive airway pressure (CPAP) machine, which involves your child wearing a mask while sleeping that pumps air into his or her throat. This isn’t always the most favorable method, so if your child qualifies, an alternative form of treatment is an oral appliance, which is quiet, less cumbersome and easy to transport. By being proactive in seeking care, the chances of your little one recovering from sleep apnea and leading a normal, healthy life are much greater. Dr. Renee Corbitt is a graduate of the University of Texas Health Science Center San Antonio Dental School. Throughout her career, she has remained an active learner, taking over 500 hours of sleep and orofacial pain continuing education. Additionally, Dr. Corbitt maintains membership with the American Academy of Dental Sleep Medicine and American Academy of Sleep Medicine, which help her provide the absolute best solutions for sleep apnea at her private practice. She can be reached for more information through her website.